One thing that most couples don’t seem to realize when planning their “big day” is just how quickly that day comes and goes. You spend months and months planning and getting every last detail just right, then in the blink of an eye, it’s over. There’s a natural letdown after your wedding day is over, but through your wedding photographs, it doesn’t have to end when the reception is over and all the guests leave. High quality wedding photos have the power to make your Cancun wedding last forever. They preserve the magic of the day and help connect future generations with the past. Sometimes, they can even help remind you of all the things that brought you together in the first place, if you happen to lose your way. I’ve met a lot of couples who wished they’d given more thought to choosing a Cancun wedding photographer, but once the day is over, it’s over and you have to live with your pictures. Of course, one of the elements that makes the planning process, and the wedding day, more enjoyable is finding the right people to take care of some of the more intricate details for you. This is especially true if you’re planning a Cancun wedding. The Riviera Maya coastline is one of the most picturesque you’ll ever find, but its location may pose some challenges if you don’t have the right kind of help. You may not know this, but most resort weddings use the same set-up, the same furniture and the same accessories for every wedding they have. These cookie cutter type weddings may run smoothly, and your album may look nice, but it will be the same as hundreds of other wedding albums out there, and who wants that? I can honestly say that I specialize in Cancun wedding photography, and I know how to make every situation unique. I know the weather patterns, how the sun shines off the ocean at specific times of day, and how to keep the wind from messing up your hair. I also have a secret weapon that you won’t find with other Cancun wedding photographers. When you agree to one of our exclusive Cancun wedding photography packages, you’re also getting the expertise of my personal customer service rep, free of charge. There’s no obligation to use her, but she has the ability to take so much pressure off your shoulders, most couples consider it a no-brainer. What does a Cancun wedding service rep do? She takes care of the little details that make your wedding truly unique. She knows her way around Cancun, and around Mexican culture and she’ll help you with things like décor, furniture, make-up, hair stylists, a videographer, a DJ, maracas or any other custom touches that you feel are necessary. Basically, she will give you peace of mind and the space to enjoy the process. And take it from me, I’ve been doing this for quite some time and it’s a lot easier to take great wedding photos at a great wedding. The bride and groom are relaxed and all the pieces are in place, so the only thing you need to focus on is getting married. The free customer service feature is really what helps a lot of couples who want a Cancun wedding to break down those last barriers and go through with it. I’m the type of wedding photographer who gets massive satisfaction from being able to help couples turn their dream of a fairytale tropical wedding into a reality. You ended up here because you’re looking for a Cancun wedding photographer, so take the next step and give us a call or send an email and we’ll set you up with an information package that explains everything. Talk to you soon. P.S. I’ve actually heard stories of couples scheduling photo shoots months after the wedding, in full wedding attire to replace what they have because they were so unhappy with the originals. 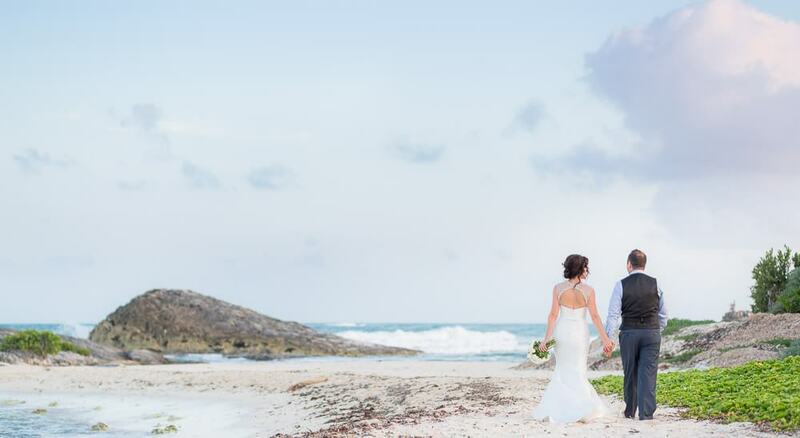 Take your wedding photography seriously, because going back to Mexico to re-shoot will cost a fortune!